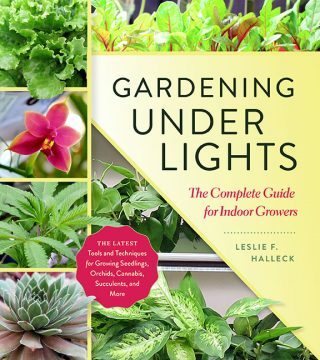 Gardening Under Lights: The Complete Guide for Indoor Growers (2018) is a great new book by Leslie F. Halleck for Timber Press. Offering “the latest tools and techniques for growing seedlings, orchids, cannabis, succulents, and more,” Gardening Under Lights is a wonderful introduction to growing indoors while also offering very technical and detailed guidance. Halleck, who holds a master’s in horticulture from Michigan State University and is a Certified Professional Horticulturist via The American Society for Horticulture Science, runs Halleck Horticultural, a company that provides consulting services to green industry businesses. In Gardening Under Lights she shares her over 25 years of horticultural experience with her readers. It’s difficult to create an introductory book that can be used by more advanced growers, but Halleck has managed to do just that. The book is divided into three main sections: Light, Growing Conditions, and Plants. Within the first section, Hallack outlines the basics—why plants need light and how plants respond to light—followed by information about measuring light and different grow lamps. Section two includes information about managing one’s environment, common pests and diseases (along with suggested treatments), and propagation and plant care. Finally, the third section is heavily focused on edible plants (including Cannabis), with a healthy portion of the section devoted to the growing of ornamental plants. Appropriate both for readers who want to know what lights to find to make a few more houseplants happy, and for readers who envision a more industrial production, Gardening Under Lights is a timely and very useful new book.